Home > Invasive Tests > What Does a Thallium Stress Test Involve? If you have symptoms of heart disease, or a family history that suggests you may be at risk, it is important to have tests to monitor the way that your heart is working. The thallium stress test is one technique that is useful for visualising how well the blood flows to the heart muscle and through the heart when you are exerting yourself and when you are at rest. It is called a stress test because it involves putting the heart under stress to see how it behaves. This is done either by exercise or by giving a drug to make the heart work harder. Why is a Thallium Stress Test Done? One of the main things that doctors look for during a thallium stress test is whether any of the coronary arteries are blocked, where any blockages are and how bad they are. It is also used to look at the heart of someone who has had a heart attack to assess the extent of muscle damage. After treatments such as coronary artery bypass surgery or balloon angioplasty, a thallium stress test can also show how successful the procedure has been, and if there are any outstanding issues with blood flow to the heart muscle. 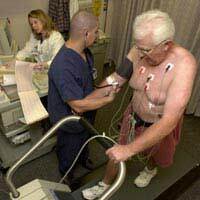 The test can also reveal why a patient is experiencing chest pain and how much exercise they can do without risking a heart attack. What Happens During a Thallium Stress Test? In the first stage of the test, you are asked to start exercising on a treadmill or exercise bike. You will be hooked up to a heart monitor and all your vital signs – heart rate, blood pressure and breathing rate – will be carefully checked. Once you have been exercising hard for a few minutes, the medical team will be able to see when your heart is working at its maximum level. It will now be under some stress. At this point, you will be given an injection containing radioactive thallium into one of your main veins. As the radioactive thallium circulates through your body, you are asked to lie still under a gamma camera, which looks like a large scanner. As the thallium reaches your heart, the camera takes a series of pictures to build up a good view of how your heart muscle is getting new oxygenated blood. Any areas that are not properly perfused – they aren’t getting enough blood – will show up. Over the next two hours or so, all you then have to do is lie still while the camera takes more pictures. The radioactive thallium keeps circulating through your body and, as your heart slows down as you recover from the exercise, this provides useful information about how your heart recovers from stress, and how blood flow to the muscle is maintained at rest. What can a Thallium Stress Test Show? Other tests can show how the blood flows through the coronary arteries at rest but this test uses exercise to stress the heart to give more realistic information. No-one lies still all day and doctors need to assess if someone with a normal looking heart is going to run into serious problems if they walk up a hill, for example. The test can show if a coronary artery is partially blocked, and may pose a danger of a future heart attack. If you are having a thallium stress test after a heart attack, the test will show how much of your heart muscle has died. Dead areas of heart muscle do not take up radioactive thallium at all, so it is obvious how much of the heart has been damaged and how much may need to be bypassed in a coronary artery bypass operation. What If I Can’t Do Exercise? If you need a heart stress test but you are not well enough to ride an exercise bike or go on a treadmill, you will be given a drug such as adenosine. This will increase the amount of blood that flows to your heart, producing a similar effect to strenuous exercise. The results will show how your heart responds to stress, without putting you in danger from a sudden bout of exercise.